Lord Berrybender and brood continue their western exploration, in this second in a four-part series (Sin Killer, 2002). 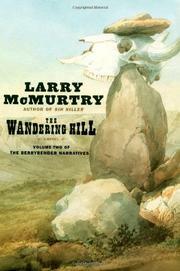 Tongue still wedged firmly in cheek, McMurtry throws his supremely confident band of aristocrats up against the toughest challenges, including a buffalo stampede, hostile Indians, wretched weather, and bloody-minded mountain men. None is rougher than Lady Tasmin Berrybender’s handsome husband Jim Snow, the gifted trapper and brutally fundamental Christian whose distaste for Tasmin’s erudite and occasionally profane chatter leads him to paste her one in the kisser. Two actually, one to the temple and one to the mouth, her pregnancy notwithstanding. Leaving Tasmin to ponder the error of her ways and the mystery of his, Jim strikes out alone, to clear his head and give his ears a rest from the incessant prattling of the diminished but still large brood of aristos and their retainers. Their river transport having been crushed by the frozen Missouri and the crew having been hacked to pieces by angry natives, the Berrybenders have holed up for the winter at a trading post where time and pregnant bellies hang rather heavy. Tasmin, irritably sorting out her feelings for Jim, has the ardent attention of tongue-tied Kit Carson and the artistic attention of painter George Catlin, who has in mind an epic American allegorical tableau featuring Tasmin and her father’s equally gravid ex-mistress Vicky. Meanwhile, the errant Jim Snow decides to reclaim his two Ute wives, who will show Tasmin the right and silent way to go about being a wife. Alas, the senior and more competent wife has died in his absence, but the teenaged number two proves to be a superb nanny after Tasmin is delivered of a son, Montague. Will Jim warm to his heir? Will he deal with those pesky anger management issues? Will Tasmin learn to control her tongue? Will she come to terms with bigamy? Will there ever be a meeting of the minds between the overcultured Europeans and the oversimplifying Americans? Big issues masquerading as light fun. Highly entertaining.